The adjustments of the temperature profile during gas chromatography change the ramp rate of the components of the mixture, allowing the quick elution of the desired component. 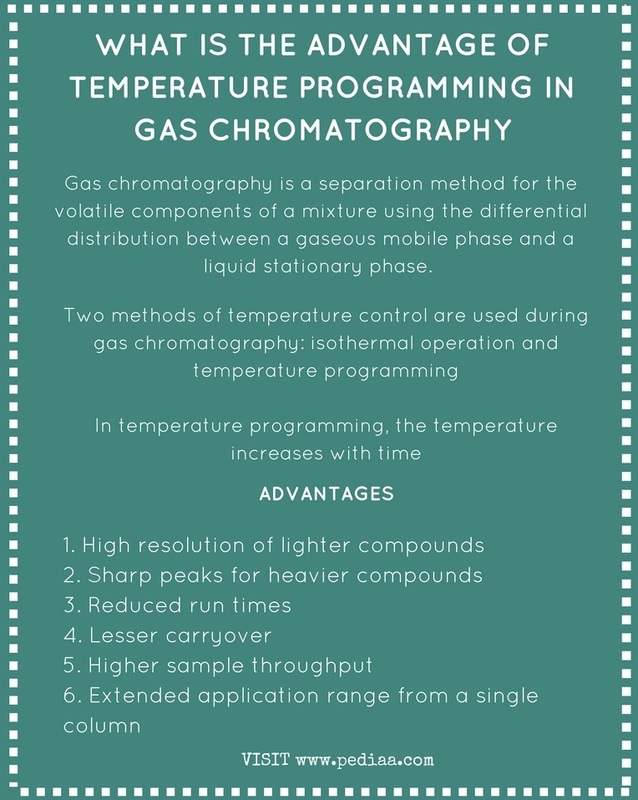 During the separation of a mixture with unknown components by gas chromatography, a generic temperature program is used in the investigation of retention behavior of the components. Gas chromatography is an analytical separation technique used in the separation of a mixture of volatile compounds. Several factors such as boiling points, molecular weight, and relative polarity of the components of the mixture, column length, and the amounts of materials injected are responsible for the separation of the mixture. Gas chromatography is a separation method for volatile components of a mixture using the differential distribution between a gaseous mobile phase and a liquid stationary phase. The mobile phase is an inert gas such as argon, helium or hydrogen. The liquid stationary phase coats the inner side of the column as a thin layer in the gas chromatography. Boiling points of the components in the mixture – Components with low boiling points elute quickly. Molecular weight of the components in the mixture – Components with lower molecular weights elute quickly. Relative polarity of the components with respect to the polarity of the stationary phase – Polar compounds interact more with the stationary phase and elute slowly. Column temperature – Higher column temperatures elute all of the components quicker from the column. Column length – Higher lengths of the column increases the elution time. But, it gives a proper separation. Amounts of materials injected – Higher amounts from a particular component increases the elution time. The instrumentation of gas chromatography is shown in figure 1. A detector is used in the identification of the separated components of the mixture with respect to time and produces a chromatogram. Each peak of the chromatogram represents a particular type of component in the mixture. At a defined set of conditions, the elution time of a particular compound is a constant. Hence, the compounds of the chromatogram can be identified based on the elution time (qualitative measurement). The size of the peak represents the amount of that particular component (quantitative measurement). Gas chromatography uses two methods in the temperature control; isothermal operation and temperature programming. During temperature programming mode, the column temperature raises continuously at a predominant rate. The ramp rate or the elution rate is proportional to the column temperature. In the beginning, it uses lower temperatures that give a higher resolution of lighter compounds. With the increasing temperature, the ramp rate of the heavier compounds also increases. This gives sharper peaks for heavier compounds. The advantages of temperature programming are listed below. Gas chromatography is an analytical method of separating volatile compounds from a mixture. It separates compounds mainly based on boiling point and molecular weight. Temperature programming permits the higher resolution of lighter compounds and sharp peaks for heavier compounds, reducing the long run times generated by heavier compounds. 1. “Temperature Control of the Gas Chromatographic Column.” Lab-Training.com, 29 Dec. 2015, Available here.